Cloud Foundry components include a self-service application execution engine, an automation engine for application deployment and lifecycle management, and a scriptable command line interface (CLI), as well as integration with development tools to ease deployment processes. Cloud Foundry has an open architecture that includes a buildpack mechanism for adding frameworks, an application services interface, and a cloud provider interface. See the descriptions below for more information about Cloud Foundry components. Some descriptions include links to more detailed documentation. The router routes incoming traffic to the appropriate component, either a Cloud Controller component or a hosted application running on a Diego Cell. The router periodically queries the Diego Bulletin Board System (BBS) to determine which cells and containers each app currently runs on. Using this information, the router recomputes new routing tables based on the IP addresses of each cell virtual machine (VM) and the host-side port numbers for the cell’s containers. The OAuth2 server (the UAA) and Login Server work together to provide identity management. The Cloud Controller (CC) directs the deployment of apps. To push an app to Cloud Foundry, you target the Cloud Controller. 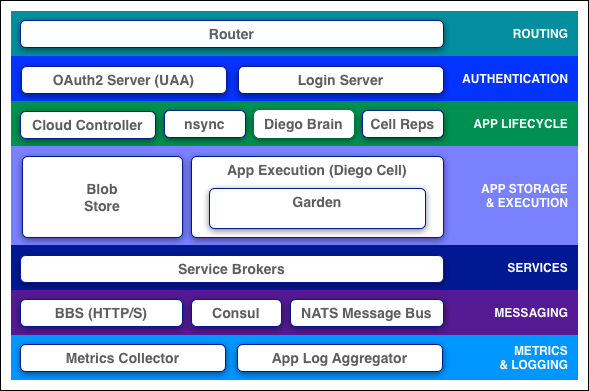 The Cloud Controller then directs the Diego Brain through the CC-Bridge components to coordinate individual Diego cells to stage and run apps. The Cloud Controller also maintain records of orgs, spaces, user roles, services, and more. To keep apps available, cloud deployments must constantly monitor their states and reconcile them with their expected states, starting and stopping processes as required. The nsync, BBS, and Cell Rep components work together along a chain to keep apps running. At one end is the user. At the other end are the instances of apps running on widely-distributed VMs, which may crash or become unavailable. nsync receives a message from the Cloud Controller when the user scales an app. It writes the number of instances into a DesiredLRP structure in the Diego BBS database. BBS uses its convergence process to monitor the DesiredLRP and ActualLRP values. It launches or kills app instances as appropriate to ensure the ActualLRP count matches the DesiredLRP count. Cell Rep monitors the containers and provides the ActualLRP value. You can configure the blobstore as either an internal server or an external S3 or S3-compatible endpoint. See this Knowledge Base article for more information about the blobstore. App instances, app tasks, and staging tasks all run as Garden containers on the Diego Cell VMs. The Diego cell rep component manages the lifecycle of those containers and the processes running in them, reports their status to the Diego BBS, and emits their logs and metrics to Loggregator. Apps typically depend on services such as databases or third-party SaaS providers. When a developer provisions and binds a service to an app, the service broker for that service is responsible for providing the service instance. Cloud Foundry component VMs communicate with each other internally through HTTP and HTTPS protocols, sharing temporary messages and data stored in Diego’s Bulletin Board System (BBS). BOSH Director colocates a BOSH DNS server on every deployed VM. All VMs keep up-to-date DNS records for all the other VMs in the same foundation, enabling service discovery between VMs. BOSH DNS also provides client-side load-balancing by randomly selecting a healthy VM when multiple VMs are available. Diego’s Bulletin Board System (BBS) stores more frequently updated and disposable data such as cell and app status, unallocated work, and heartbeat messages, as well as longer-lived distributed locks. The BBS stores data in MySQL, using the Go MySQL Driver. The route-emitter component uses the NATS protocol to broadcast the latest routing tables to the routers. The Loggregator (log aggregator) system streams application logs to developers.